What do you do if you're a hot-rod fan that wants to stick out from the crowd? 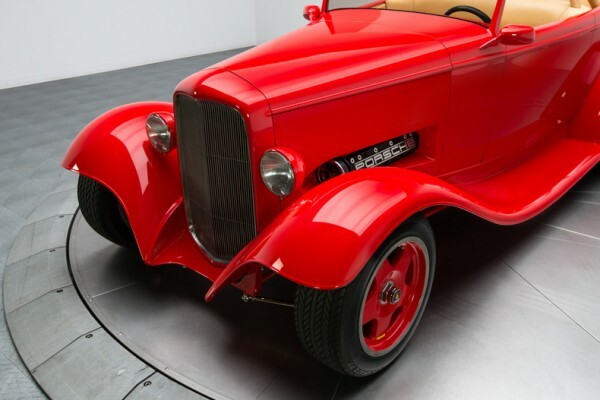 If you've ever been to a street-rod show, you'll know that many of the cars on display use the same visual cues, they all use Chevrolet small-block V8s stuffed into fiberglass recreations of 1932 Ford "three window" bodies. It's all a bit homogenized, a bit boring, to be frank. This little drop-top Ford does things differently. Using a proper Porsche 928 V8 overhead cam engine, this hot rod makes a rumble that is distinctly German sounding. While the body is still that instantly familiar Ford roadster shape, the underpinnings of the car are Porsche through and through. From the images, we can tell that the engine used is an earlier single-cam engine, which places the 345 Horsepower estimate a likely bit high of the mark. Regardless, the "hot cams", free flowing exhaust, and gaggle of carburetors will help the engine perform quite well, especially when not weighed down by its original hefty 928 bodywork. When channeled through the 928's Mercedes-Benz sourced 3-speed automatic transaxle (now fitted with a high-stall torque converter), and the original Porsche rear differential, this unorthodox rod is sure to accelerate with gusto. The brakes package is cribbed directly from Porsche's 930 Turbo, using those giant black Brembo calipers on some nice wide vented rotors. In this application, the light car should shed speed, stopping really quickly with such an excellent brake package. The chassis is an all custom tube-frame that has been built to optimize on-road handling, though compromised to fit within the Ford body shell. It should handle quite well with Corvette-derived mount points and geometry, though perhaps not as well as "Porsche-derived mount points and geometry" would. 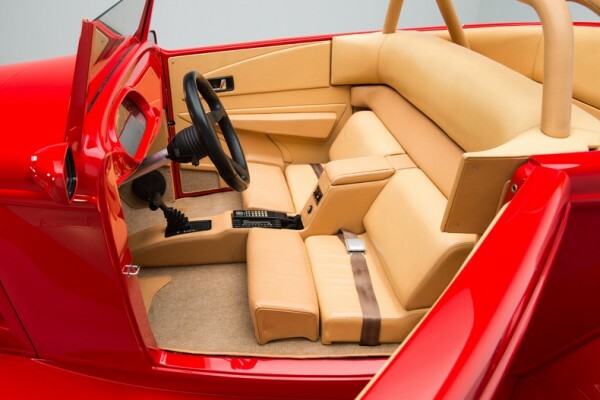 The interior of the car is 100% unique in the hot-rod world, having been inspired by Porsche's low-slung 928 interior. The gauge cluster, door design, and center console look as though they could have been plucked directly out of Porsche's Grand Tourer and shoved into this body. It is a very 1980s look inside, which somehow doesn't clash with the 1930s look outside. In the end, it all comes down to what you want the car to be. This car was built for the express purpose of arriving to street rod shows, rolling off a trailer, and wowing judges. While the car was built 25 years ago, this Porsche-powered rod still looks like brand new, and can still be an impressive addition to any Porsche-based collection. If I were the one to buy it, however, I know I'd be looking into upping the ante by installing a later 928 GTS twin-cam V8 and the Getrag-built 5-speed transmission. That would be sure to wow the judges, as well as any of your passengers. As of publishing time there were only a few hours remaining on the listing, so if you want a Porsche 928 V8 powered street rod, now is your chance. The true appeal of building a classic is expressing individuality through an evolving canvas that eventually becomes a rolling extension of its creator. And whether that means constructing a custom from the ground up, or taking a solid foundation and adding just enough detail to achieve perfection, the hobby certainly has no shortage of ideas, inspiration or talent. Unfortunately, if you're a jaded, long-term car junkie, chances are you'll probably have a hard time rekindling the wide-eyed excitement that sparked your decade's old addiction. So, what does a seasoned gearhead do when he loses his appetite for striped Camaros and fiberglass 3-Windows? He snatches up a super cool rarity like this stunning Ford Victoria! Built by Jerry Brassfield of Pacific Summit Motorsports, this killer custom wraps a silky Porsche V8 and stalwart 3-speed transmission in a hand-built body and custom Connolly interior. If you like to look good, win trophies and turn heads everywhere you go, your 'phantom phaeton' awaits! Nicknamed 'Deuception', this hot Ford's unique body began life as rare Morgan Manufacturing Collector's Choice fiberglass that was tastefully modified by a multitude of customizers. That said, the driving force behind its construction was master fabricator Paul Newman of Newman Car Creations; a name you've undoubtedly heard if you're familiar with Goodguys awards or West Coast car culture. As we all know, successfully executing any ultra-clean street rod means you have to go the extra mile to get everything laser-straight. Fortunately, Newman and his star-studded cast expended hours of dogged dedication to create a perfect foundation for a spectacular coat of Porsche Indian Red lacquer. And today, this stunning custom is a swell of virtually unbroken reflections that create one subtle yet impressive classic! Of course, subtle doesn't necessarily mean skimping on the details. This well-executed coupe strikes an excellent balance between Ford's unique pre-war design and the monochromatic style of modern hot rodding. At the front of the car, custom, tightly-radiused fenders anchor clear H4 headlights at the sides of a billet grille and clean, body-matched shell. At the top of that grille, a 3-piece hood rolls to Dan Fink windshield posts, smoked glass and a one-off Marcel's Custom Metal roof. At the sides of that glass, a characteristically simple profile features custom heat extractors, phaeton-style doors and small red mirrors. And behind those doors, a billet fuel filler and 4-point roll bar ride above smooth tail lights and custom, increased-width fenders. 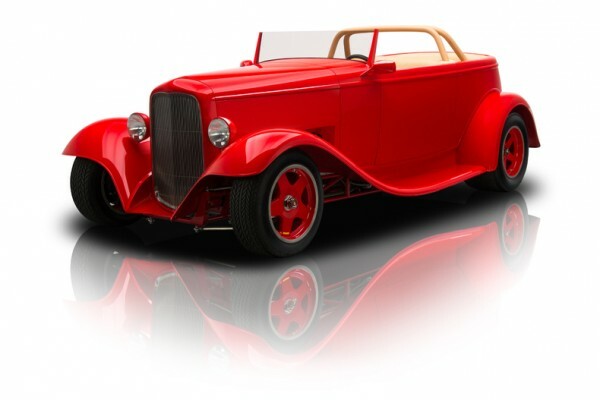 There's certainly no mistaking a classic Ford shape, but this roadster has an identity all its own thanks to a cohesive theme, careful workmanship and exceptional attention to detail. An eyeball-popping presence is only part of this slick street rod's excellent appeal; it also does a very good job of going fast and making noise! Looking completely natural behind the car's Indian Red hood is a smooth Porsche 928 V8 that, after some thorough tweaking, creates roughly 345 horsepower. One of only four 8-cylinder architectures produced during the company's 83 year existence, this alloy rocket utilizes a hot cam, custom intake and custom-linked Dellorto carburetors to twist stout 10 to 1 compression into rich, pavement-scorching torque. Naturally, the impressive mill has been carefully positioned using a series of custom mounts and brackets; the most interesting of which is 1975 Dodge truck motor mounts that, like original Porsche equipment, isolate the entire drivetrain. The engine's appearance is a melting pot of black, polished and machined finishes that contrasts well against the aforementioned red. Porsche exhaust manifolds, a custom aluminum firewall and a rear-mounted alternator keep the bay subdued and classy. And best of all, this sophisticated brute fires easily, drives reliably and lays waste to almost any old school muscle car that's brave enough to pick a fight. Here's where hiring a renowned fabricator like Paul Newman really pays off. Like most of his well-known creations, Deuception utilizes a custom frame that's modeled around C4 Corvette hard points to create a sorted classic which is super tight and exceptionally engaging. The car's vintage Ford style rides on a 1.25-inch skeleton that's formed from 1010 steel tubing. At the front of those bones, a Gordon Schroeder rack and pinion hangs between Newman spindles, custom 4130 chromoly control arms and Koni double-adjustable coil-overs. At the back of those bones, two more Koni double-adjustable coil-overs support a Porsche 928 differential and 3-speed Mercedes-Benz transaxle, which is fitted with a 2,400 RPM stall converter. Stops are supplied by power-assisted Porsche 930 calipers, which make excellent use of a Girling master cylinder, Tilton balance bar and 13-inch Tilton rotors. In front of those calipers, 16-inch Momo magnesium road wheels spin Porsche center caps inside 205/55 Pirelli Cinturato P7s and 27.0x13 Goodyear racing slicks. And everything, from the car's chassis-mounted, low-profile exhaust to its dressed frame - visible through the front fender wells in traditional Ford fashion, has been exceptionally finished and expertly detailed. With a classic like this, experiencing the joy of open air driving is priority number one. That's why its simple interior, designed by expert craftsmen Sid Chavers and Dave Putnam, replaces 'distracting' for 'tasteful'. At ground level, gridded carpet anchors a hand-built console beneath a retro car phone, Sony CD changer and small power window switches. Seating is provided by plush Connolly buckets, which are sandwiched between big ADS speakers and angular door panels. The dash remains as stylish as the rest of the car with nothing more than Porsche 928 telemetry occupying its sleek red surface. In front of the driver, a '66 Volkswagen steering column spins a simple Momo wheel. And behind the passengers, a small storage nook features custom, color-matched luggage. 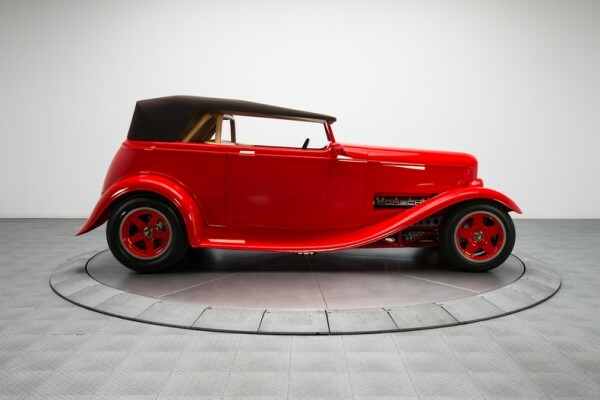 Appealing and innovative, this storied phaeton has been recognized as a milestone street rod for its incredibly unique design. In fact, the car even earned a spot in the Bruce Meyer Gallery at the renowned Petersen Automotive Museum. Don't miss your chance to experience quite possibly the ultimate combination of classic American style and storied sophistication! What’s the Best or Strangest Modified Porsche You Know Of? A ’32 five window coupe (not chopped) would have make this a much more attractive ride.